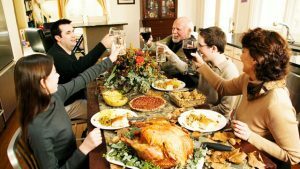 Giving Thanks – for Water! It is widely known how important water is to our lives and the world we live in. Our body and planet is comprised of about 70% water – making it seem like it is easily accessible and plentiful. However, when you rule out our oceans and ice caps, less than 1% of all the water on Earth is drinkable. Of that less than 1%, groundwater only accounts for 0.28% of fresh water around the globe. Safe drinking water is a privilege we often take for granted while we brush our teeth or drink a glass of water in the morning. While we are giving thanks to our family, friends, and food during Thanksgiving, we should also give big thanks for our clean drinking water and the people who make it happen. 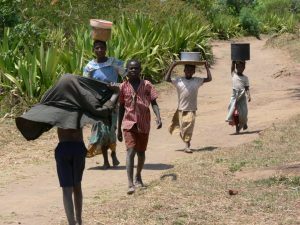 Villagers in Malawi travel miles to find and transport water which is rarely safe for human consumption. Keeping yourself hydrated can do wonders for your health. The benefits water provides for our bodies range from relieving headaches, flushing toxins out of the body, improving mood, helping with weight loss, and relieving fatigue. In the U.S., we are fortunate enough to have some of the cleanest drinking water anywhere in the world to keep us healthy and safe. In other countries and for some 783 million people, that is not the case. Many do not have access to sufficient drinking water and the water they do have often contains dangerous pathogens. Often, unclean water sources are miles from villages and some people are forced to spend hours each day simply finding and transporting water. The typical container used for water collection could weigh between 40 and 70 pounds when filled. Imagine how difficult it would be to carry the equivalent of a 5-year-old child for three hours out of each day just to have water to drink. With so many people not having access to clean drinking water around the world, it is important to appreciate the plentiful and safe drinking water we have here in America. 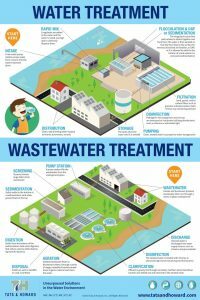 A visual diagram of water and wastewater distribution systems. Click the image to see full size. When looking at America’s clean water, it is especially important to give special thanks to the water and wastewater utilities that work nonstop to give us some of the cleanest drinking water in the world. Despite the fact that our country has beautiful rivers and lakes, the water that comes from them to our taps goes through several processes that require a lot of work and maintenance. Our water and wastewater utilities maintain some of the highest standards in the world when it comes to drinking water, and new innovations for treatment and distribution are always being researched and implemented. Water and wastewater employees work tirelessly to meet regulatory requirements and preserve local waterways despite major setbacks like deteriorating infrastructure and shrinking funding for necessary projects. On top of treating our water, utilities are responsible for keeping their distribution systems running efficiently and also to being stewards to the environment through improving effluent quality. Our water utilities are arguably the most important utilities in the nation because water is so crucial to our survival.